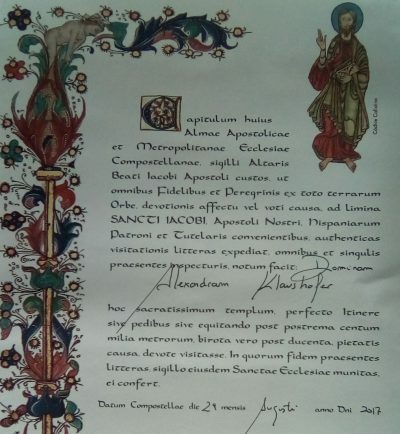 I’ve finally fulfilled a long-held desire to be a pilgrim and got my compostela (official certificate) for having completed a section of the Spanish pilgrimage route the Camino de Santiago. I’ve long wanted to do the Camino, a contemporary form of pilgrimage which is undergoing a resurgence, attracting 21st-century pilgrims of all faiths and none. My first attempt at the Camino was deferred by the death of my mother in 2011; its taken me all this time to get back round to it and, since then, the numbers receiving the compostela have gone up by almost a hundred thousand, rising to almost 280,000 in 2016. In late August I set out for Santiago from Ferrol, having chosen to do the relatively quiet Camino Ingles. The people I met on my first day confirmed the open, pluralistic spirit of the contemporary Camino. On the outskirts of the city I met a local who had done that route ten times because he loved it so much, and then walked a while with a group of Spanish students from Valencia. ‘Are you doing this for religious reasons or for the experience?’ one asked me. The latter, I replied, although I didn’t make a hard distinction between the two. It was the same for him, agreed the student; while not a religious requirement, the Camino is more than just a hike. That evening I had dinner – a ‘pilgrim’s menu’ for nine euros – with a Catholic priest from the Netherlands. But the growing popularity of the Camino is also giving rise to a new type of pilgrim that I liked less. These focused, driven walkers tend to get up soon after five, filling the dormitories of the pilgrim hostels with flashlights and the sound of hurried packing. Then they take off into the dark, often arriving at their next destination by the middle of the morning. Those doing the ‘sports camino’, as a like-mind amiga de camino put it, are determined to win the race for beds which in the summer months, even on the Camino Ingles, are in increasingly short supply. The other side of the Camino revival is the degree to which it is embedded in modern Spanish culture. Almost half the pilgrims are Spanish and, I heard it said more than once, that ‘most’ Spaniards are expected to do the pilgrimage at least once, while for the young, gaining a compostela is akin to getting a Duke of Edinburgh award. For the pilgrim, this translates into a great sense of being supported along the way. Locals, seeing you plod past their house with your rucksack, often wish you buen camino, sometimes shouting to correct you if they think you’re about to take the wrong path. Much is made, in the literature about the Camino, about the sense of history you get from walking the paths trodden by the pilgrims of millennia past. But for me, the sense of being part of something bigger came more from having a living connection to the place I was in, one largely created by the understanding and acceptance of the people around me. One Spaniard I met in a bar – a bicycling pilgrim from Valencia – attributed the success of the modern Camino to the Galician people. ‘Galicians are polite’, he said, adding that if the ancient pilgrimage route had lain in the south of Spain he doubted whether pilgrims would have received the same warm welcome. He attributed the Galician temperament to the region’s remoteness, which had shielded it from some of the perils of modernisation and the trauma of the Spanish Civil War. And there’s no doubt that Galicia – which, like many rural regions of Europe, has suffered mass emigration – can do with the economic benefits of the Camino. 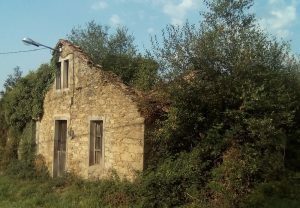 Many empty houses litter its landscape, some bearing hopeful ‘SE VENDE’ notices, while others are fast going back to nature. Coming from a crowded, property-mad island, it made me sad to see so many idyllicly-situated homes being abandoned. So the fact that the modern Camino is a business which benefits the locals cheered me: what better form of tourism than one which feeds both body and soul in a way that stays true to the character of the place? But I wasn’t disappointed by the show the Cathedral put on at the twice-daily Pilgrims’ Mass. The music, provided by a powerful organ and some very good soloists, was the best I’ve heard in a Catholic church, and the priest officiating communicated a real sense that we, as pilgrims, had achieved something meaningful. Watching the botafumiero (giant incense burner) swing dangerously above the congregations’ heads to almost touch the ceiling – it took eight priests to pull the rope – was genuinely exhilarating. Collecting my compostela in the Pilgrims’ office, I had to choose a column giving my ‘motivo’ for doing the Camino. On the page I filled out, eleven people had ticked ‘religious’, eight ‘spiritual’ and one the ‘tourism/sports’ column – further confirmation of the range of reasons for doing the Camino. So it was a shame that the alternative pilgrims’ ceremony I had been invited to en route didn’t, in the end, take place. Organised by a Franciscan monk in a spirit of ecumenicism, it seemed the right way to end a 21st-century pilgrimage.